Beto Espinoza, left, and Ramiro Cavazos perform Jan. 18 at La Villita Dance Hall in San Benito. Ramiro Cavazos, one of the all-time great legends in border music, played at La Villita Dance Hall in San Benito on Jan. 18. 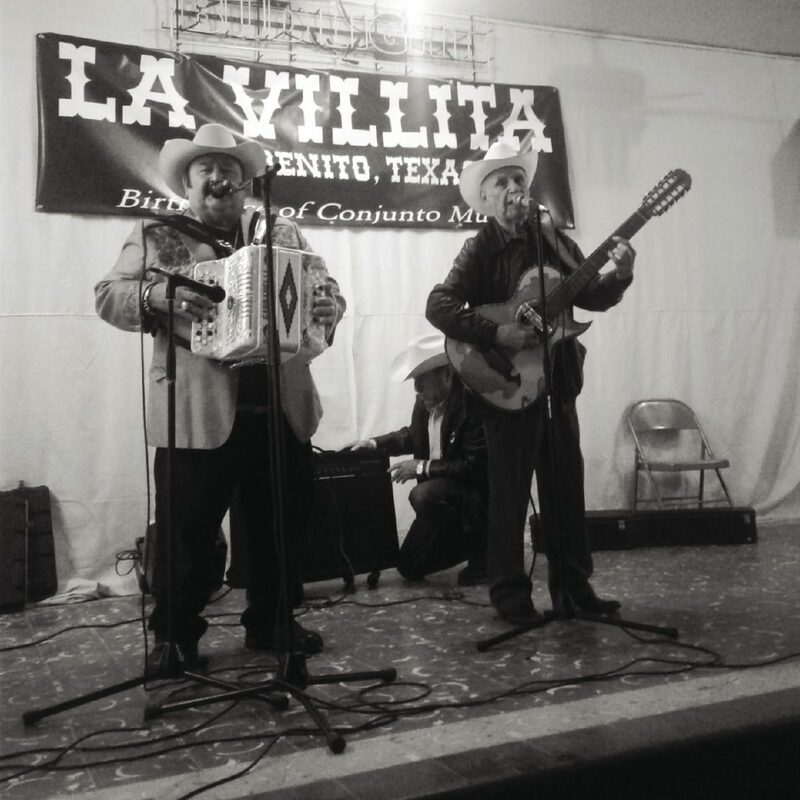 La Villita Dance Hall has been around since the 1940s and 1950s, the same era where Cavazos, as the bajo-sexto player to the iconic norteño conjunto Los Donneños, first made his mark here in the Rio Grande Valley. Since the passing of accordionist Mario Montes Sr., Cavazos’ musical partner in Los Donneños in the 1990s, there have been different accordionists that have played with Cavazos. In the last few years, Beto Espinoza has been filling that role. On this cold, rainy night, Cavazos and Espinoza played the Donneños brand of rancheras and polkas to a modest crowd of fans from yesteryear and new fans. It was really sweet and like take a time machine back to when Cavazos and Los Donneños reigned as one of the top bands in this area. My favorite moment was when accordionist Alan Cavazos, the grandson of the legendary norteño musician, stepped up to the stage and played several beautiful instrumentals with his grandfather. The music was just so beautiful and graceful. Rare to see a young accordionist, one that is in his 20s, play a style from his grandfather’s era and actually do it justice. Afterward, I went up to the stage to buy their CD together, “Alan Cavazos y Don Ramiro Cavazos, Polkas, Redovas, y Huapangos, El Nieto y El Abuelo (The Grandson and the Grandfather).” The album is exactly the type of music they were playing together on stage the night. When I first interviewed Cavazos for my first article for The Monitor back in January 2012, I told him he was the first musician I would be interviewing. He humbly told me I would be going on to interview more important and bigger musicians in the future. I laughed and said no, and I still stand by that. Cavazos is a few weeks shy of turning 91, and he is still the person I’m most happiest to have had interviewed these past six years for The Monitor. Let’s hope Cavazos continues playing music well into his 90s, and continues sharing his beautiful music with all of us here in the Valley.